Year C, Lent 3, 2016 – We Repent, Already! We’ve been swamped with our day jobs and some personal things that needed our attention, so we are way behind this week. Here’s the short form of the show notes, so we can get the show published. We’ll try to update the notes with more good stuff soon. Thanks for your patience. Isaiah 55:1-13 [2:16]- Okay, post-exilic call to repentance. Don’t waste your time and resources on what doesn’t satisfy. God is in control and knows more than you do. Try doing things God’s way. Then even nature itself will rejoice! So, listening, feasting, leadership, and atmosphere. 1 Corinthians 10:1-13 [11:21]- This one gave us fits, at least for starters. Paul compares the Hebrews’ wilderness wanderings with Moses to the Corinthians’ experience in Christ as a negative example. Don’t be like them! he urges. Learn from their example. So, instructions, baptisms, clown shoes, yoga, and not desiring evil. … It will make sense when you listen to the show. Luke 13:1-9 [19:47]- Jesus tackles the question of random acts of violence and devastation. At first it doesn’t sound like a very logical response, and maybe it isn’t. It’s an urgent response, calling for all to repent, but you just never know. Also, a fig tree that doesn’t give figs. Are you sensing a theme yet? 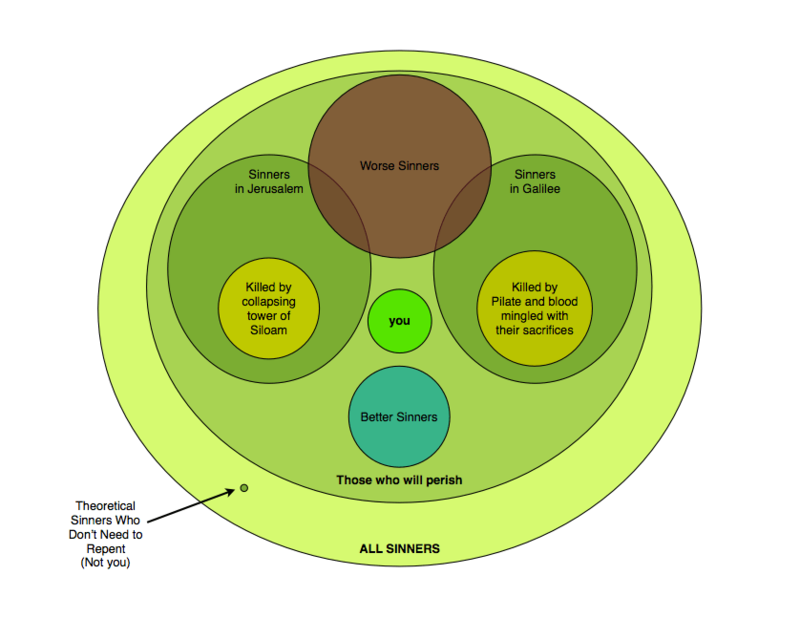 So, figs and sin, the Venn diagram avocado of sinners (see below), be the tree, and digging around the tree imagery.